First of all, we must establish what we mean by “electric blue.” It refers to the color of the iridescence, not the base color of the glass. 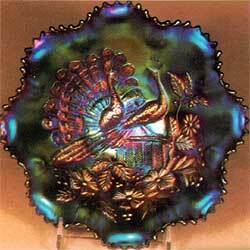 Usually the base glass color of a piece with electric blue iridescence is also blue, but that doesn’t have to be the case. 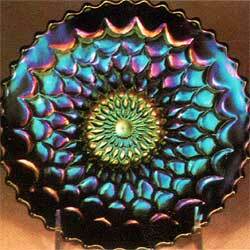 There are many purple pieces with electric blue iridescence. 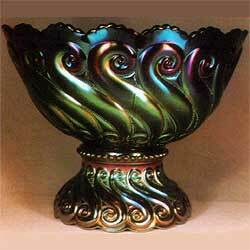 In fact, we have a couple of green pieces (waterlily master bowl and Fenton’s Peacock and Urn bowl) that have electric blue iridescence. Millersburg made very little blue Carnival, but I’ve seen a few pieces with an iridescence that could be called “electric blue.” Even in these instances we still call it “radium.” If it isn’t “radium” we then call it “satin” iridescence which is also a term used most frequently with Millersburg. Dugan is well represented here. Each of the items shown–Many Fruits (photo#1), Dugan’s Cherry (photo #2), Four Flowers (photo #3), Dogwood Sprays (photo #6), S-Repeat (photo #13, Fishscale and Beads (photo #14), and Heavy Iris (photo #15)–are on purple base glass. 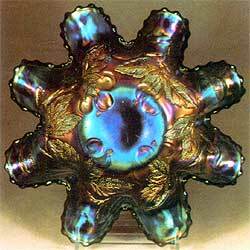 Dugan made very few pieces of blue base glass Carnival so most, if not all, of their electric blue iridescence will be on purple base glass. 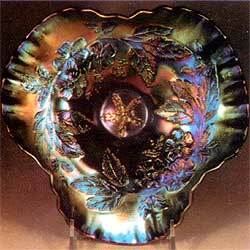 While I have not made an extensive, over-all study of the number of pieces made, it would appear that Dugan was the leader in this type of iridescence. Northwood is well represented with Greek Key (photo #4), Peacocks on the Fence (photos #5 and #9), and Three Fruits (photo #8). 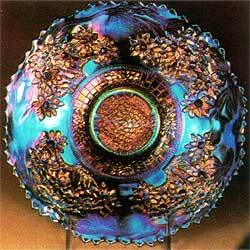 While each of these pieces is on blue base glass, they also used electric blue iridescence on many of their purple pieces. 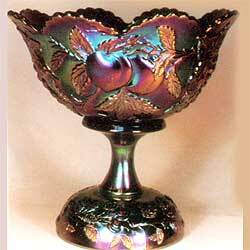 Examples are Grape and Cable, Peacock and Urn, Peacock at the Fountain, Strawberry, Good Luck, Tree Trunk, etc. 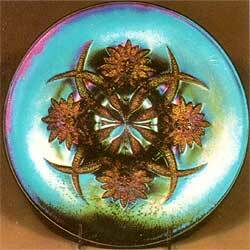 It would appear that Northwood was the runner-up to Dugan when it came to electric blue iridescence. 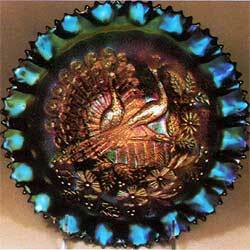 There is a wide range of Imperial Carnival with brilliant iridescence, but I have trouble calling much of it “electric blue.” I have shown three pieces here–Colonial Lady (photo #10), Thumbprint and Ovals (photo #11), and Fashion (photo #12)–that come very close to having electric blue iridescence, but even then it tilts a bit more to the purples than the Northwood and Dugan pieces. So, if someone wants to argue that this “high” color used by Imperial is not really electric blue, I feel they might have a good point. 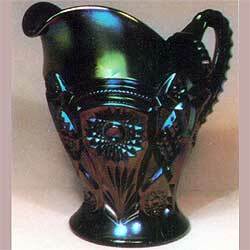 Imperial made very little blue base glass, so if we call any of the iridescence “electric blue” it will quite surely be on purple base glass. 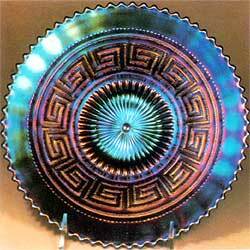 The blue Lustre Rose fernery might be an exception. When I think of Fenton Carnival, I think of cobalt blue. 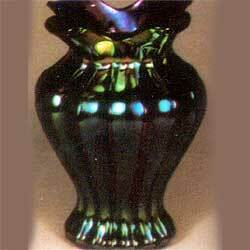 It should follow that Fenton produced the bulk of the pieces with electric blue iridescence. Such does not seem to be the case. To be sure, they did produce some and the Orange Tree plate in photo #7 is an excellent example. 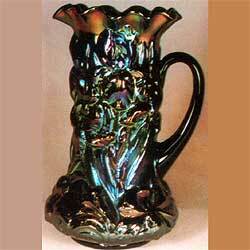 Much of their cobalt blue base glass, however, carries a Millersburg type satin rather than an electric iridescence. Also, there seems to have been no uniform practice. 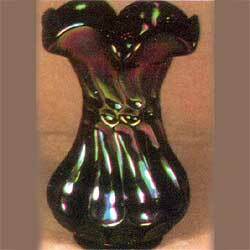 Dugan’s Wishbone and Spades for example, is almost always electric, but Fenton pieces such as Stag and Holly, Peacock and Urn, etc., may have either satin or electric blue iridescence. 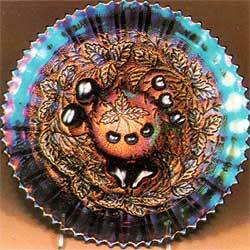 So in the final analysis Fenton trails many of the other companies when it comes to this type coloring. Well, this is probably more than you ever wanted to know about “electric blue.” I’m also sure there are many unanswered questions. It is well to remember that color, like beauty, is usually in the eyes of the beholder.